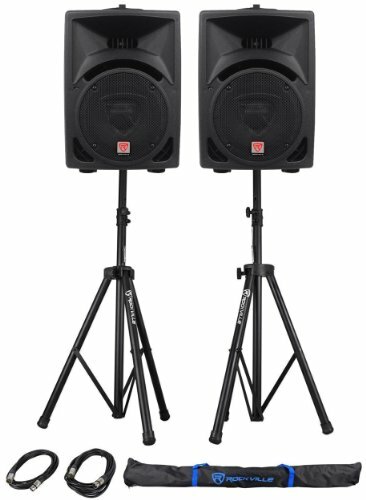 Rockville RPG8 8" Active/Powered 400 Watts DJ PA Speaker System. 100-Watt RMS / 200 Watts Program Power / 400 Watts Peak. High power long-throw 8'' woofer with 2" aluminum voice coil provides incredibly deep bass and acoustic power. Frequency Response: 50Hz-20KHz. Maximum SPL @1w/1m: 119dB peak / 116dB continuous. Line RCA and XLR input with separate Gain adjustment. Additional balanced line output via XLR for linking of additional speaker systems. Versatile trapezoidal enclosure design allows different positioning. Flyable and stand mounting with 35-mm pole socket. Ergonomically shaped handle for easy carrying and setup. High-quality components and exceptionally rugged high impact ABS construction. Amplifier clip limit LED indicator & power LED cabinet rear. Front display power meter Blue LED. Adjustable Height . Steel Construction . Black Color . Weight capacity: 100 LBS . Adjustable Height Range: 47.25-78.75 inches . Base spread: 15-40 inches . Tube Diameter: 1.5 - 1.37 inch . Leg Diameter: 1.37 inch . Includes (2) 20 Foot XLR Female to XLR Male Cables . Includes (1) Travel Bag.